Frank Hampson: How the Creator of Dan Dare is a Ladybird Legend in his own right. For non-Ladybird afficianados Hampson is probably better known as the artistic creator of Dan Dare. That is not to say his work with Ladybird is under exposed. 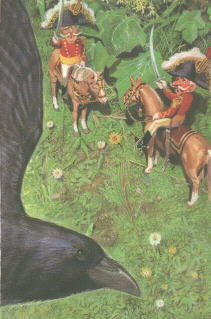 Many people will remember his unique style in the Nursery Rhyme series but as children we may not so easily have connected the author as the chap who drew for the Eagle. Different genres entirely and yet the magic of Hampson is that he is so easily identifiable. Hampson was born in 1918 in Manchester and as a child lived in Southport. At the age of 13 he entered a Meccano Magazine art competition, winning a prize and an invitation to provide commissioned drawings. His first job after leaving school at 14 was with the Post Office, spending any spare time there sketching on office stationary. In 1935 he was asked to contribute to the GPO magazine and his first 4 frame cartoon appeared there that same year. His burgeoning talent was spotted by a T U officer who suggested Frank try for Art College and in 1938 he enrolled at Victoria College of Arts and Science. Frank was called up at the start of the war and later was sent to Dunkirk. He saw action in Normandy and the Low Countries. After the war he resumed his art education at the new Southport School of Arts and Crafts. He then went on with his fellow student Harold Johns to found a Commercial Art Partnership to supplement their incomes. In the late 40s Frank struck up a friendship with a Southport vicar, Marcus Morris, who requested Frank's input in the parish magazine. Later they would produce the highly successful Eagle comic with Frank as illustrator in chief. In doing so Frank became increasingly interested in children's comics, collating examples from the best such as the Dandy, Film Fun and Adventure as well as American and Canadian picture pulps. Frank then established an artist's studio in Southport. "The bakery", no more than a run-down shed. It did however provide the workers with a glass roof for a nominal rent. Frank's pivotal involvement with the Eagle is a most interesting part of his career *. However to describe it here in detail would, I fear, digress from his Ladybird work. Suffice to say that Frank was well versed in the genre of art for children when he started to work for Ladybird (then known by their publisher's name of Wills and Hepworth). His experience during the war also undoubtedly influenced his images. Hampson first worked for Wills and Hepworth during the decline of The Eagle. He was obviously a good name to have with such a reputation and yet it seems his full potential was squandered as he illustrated so few titles. 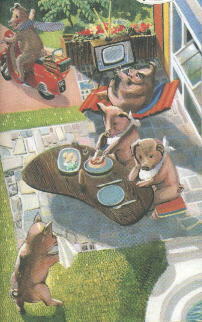 Soft Humour is prevalent in Hampson's work, most evident in the Nursery Rhymes series. However gentle playfulness can be found in the more factual works too, such as the rather ropey riding of a penny farthing in Transport Through The Ages. A study of the facial expressions of many of his characters exposes a sense of fun. Their over-acted response, akin to music-hall comedy, tied in with the often lavish costumes of the historical character, gives the work a real sense of theatre. In contrast to the jovial moods portrayed, there lurks a darker take. Examine closely the pensive mood of the admonished - and in the Nursery Rhymes there is often a sense of creeping menace and punishment. A sense of deep resignation appears on the faces of many historical players and re-examining the happier expressions give one a sense of propagandist posturing - "It's alright, boys" as the legion marches off to their fate. And see the slightly pained smile of Queen Matilda being led down the aisle. 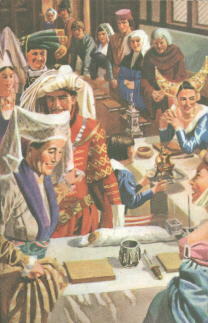 Historically there is great licence in representing historical facts that we know to be chestnuts - King Canute is given a Pythonesque interpretation, Medieval Banquet scenes are given a nice middle-class sense of decorum and cleanliness. And a surprisingly enthusiastic embrace of Darwinism gives us a scene out of Planet of the Apes as representing early human hunter-gatherers. This was certainly a more attractive method of giving history to children. Unfortunately this legacy of extending the boundaries of truthfulness is with us still today and the aphorism that only winners write history is maintained. Historical and moral allegory abounds of course in the Nursery Rhymes series. I mentioned before the possible reference to Mary Queen of Scots in the Mary, Mary rhyme. There are many more which Mr. Opie could elaborate on - what Hampson does is to perfect a visual interpretation into a distinct style which makes wonderful use of character, costume and colour. Fantasy is clearly an important element in Hampson's ouevre. Heightened colour, exaggerated expression and original composition dictated heavily by unusual perspective are Hampson's trade marks. There is often a sense that we are looking in on a dream-like tableau, that the characters within the scene are not aware of being observed and yet their gaze can even appear to fall towards us. The perspective can make us feel giddy as we look down or up at scenes normally viewed straight on at eye level. The viewer shrinks to a field-mouse or we are transformed into a looming giant so that we become the make-belief looking in on normality. Distortion of Scale is often deployed to throw off our sense of reality. And then there is the improbable put into a real enough setting or indeed the other way round. Hampson throws in decoys that take us to the edge, and then with an array of colour and shape so pleasing to the eye spins us back into the heart of the image. When Hampson died (in the 80s), he was unrecognised as a great artist. He maintained a job teaching art at college retiring with ill-health and during his lifetime never fully credited for his enormous influence on British Comic and Science Fiction culture. But that is another tale and it's not mine to tell.